Changed return x to preserve formatting of numeric strings; it is now equivalent to return (x). Changed Gui, Name: New to set the new GUI as the default. Changed ClipboardAll to prefer CF_UNICODETEXT over other text formats. Changed Gui Show to allow floating-point numbers. Changed A_OSVersion to return WIN_8 on Windows 8. Changed AutoHotkey.exe file description to include "ANSI/Unicode 32/64-bit". Changed the parser to allow lines like new MyObject() with no assignment. Improved wording of some warnings and added a pointer to the documentation at the bottom of the warning dialog. [*:2oxwabg3]Added basic support for inspecting Func, ComObject and RegExMatchObject objects. [*:2oxwabg3]Fixed the "attach debugger" message being ignored in some situations. See commit 83f0a0e. Added support for the PCRE construct (*MARK:NAME) via RegExMatchObject.Mark. Added support for classvar.x := y assignments in class definitions (after declaring classvar). Fixed Func. () to merely skip the function call if mandatory parameters were omitted instead of causing the thread to silently exit. Fixed Object.Remove() not releasing object keys. Fixed key-down/key-up hotkey pairs to suppress input correctly when only one hotkey in the pair is enabled. Fixed #Include <Lib> to not affect the working directory used by subsequent #include directives. Fixed objaddref() acting like ObjRelease() when called with a lower-case 'a'. Fixed A_AhkPath in 32-bit compiled scripts to detect 64-bit AutoHotkey installations and vice versa. Fixed TreeView controls with -Background option rendering incorrectly on older OSes. Fixed error messages shown during execution of While/Until to identify the appropriate line. Debugger: Fixed max_depth being either half the intended limit or unlimited. This caused the debugger to crash when querying objects which have circular references. The default version chosen during installation affects AutoHotkey.exe and AutoHotkeySC.bin as before, but the other executables are now also installed as AutoHotkeyA32.exe, AutoHotkeyU32.exe and AutoHotkeyU64.exe (on x64 systems). AutoHotkey.exe can be switched out by re-running the installer or by running AutoHotkey_L Setup via the Start menu or Control Panel. The new installer has many other features intended to improve the overall experience. The update script is no longer included in the installer, and does not update the additional exe files. I don't plan to update this script. Note that if you open AutoHotkey_L Setup via the Start menu or Control Panel, it automatically checks for updates and provides a link to download the latest installer. Good news! I'm happy to see you are still working on v1.1. Could you merge latest changes to v2? [*:2jb9tmnq]SetRegView and A_RegView were missing from the help file index. [*:2jb9tmnq]Polished up the .ahk file icon; see comparison below. [*:2jb9tmnq]Change the display depth to 16-bit. [*:2jb9tmnq]Change the display depth back to 32-bit. I did not need to do such things. Here's how I got the new icons to show:[*:3p76mw4u]Open Task Manager. The installer is...very confusing. On the first screen the arrows on the sides of the buttons would lead one to believe that they are something other than buttons, so when I clicked one expecting to see a dropdown menu or a page with more options it instead began installing stuff. Since I wasn't expecting that and I didn't know what it installed where, I ran the installer again so I could uninstall it. At that point it wiped out my file type association and the default script icon, so I tried to re-install just the 64-bit version; then I got an error message that AutoHotkey.exe was in use and could not continue, even though I had no instances of it running. Just to be thorough I re-booted and tried it again - same error message. So I went to the destination folder, renamed AutoHotkey.exe, tried it again and it installed but 1) it did not return the default icon back to the scripts and 2) I found that the installer had placed 4 instances of AutoHotkey.exe in my destination folder: AutoHotkey.exe, AutoHotkeyA32.exe, AutoHotkeyU32.exe and AutoHotkeyU64.exe. I had to check the file description to confirm that AutoHotkey.exe was in fact the 64-bit Unicode version. I found that the issue of the error message and the multiple exe's re-occurred when I attempted to install the 32-bit versions into my other usual destinations, and I still never recovered the default script icon. Since you posted an update to the installer while I was writing this post, I tried it this newest installer in the hopes that it would recover the default script icon; this still has not returned. Prevously this caused the thread to silently exit. Here "Prevously" may be a spelling mistake. I think it should be "previously". New icons look great! And glad to see the new installer is getting some more extensive testing now . Dotted outline box intersects with Apply button. Since I wasn't expecting that and I didn't know what it installed where, I ran the installer again so I could uninstall it. Since you apparently have multiple versions of AutoHotkey_L installed, I can understand your confusion. 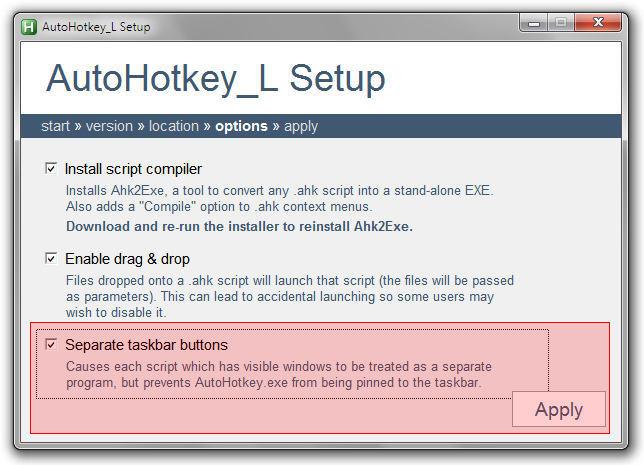 Neither of the AutoHotkey installers are designed to work with "parallel" installations. "Upgrade" and "Repair" in the new installer read the install location from the registry, so I'd say it installed in whichever directory you installed in last. On a system with a conventional AutoHotkey installation, the new installer should simply upgrade the existing installation, with no fuss and no need for further detail. For any type of installation (new, upgrade from 1.0, update, or running setup after installation), "Custom Installation" or "Modify" will show all of the options. That is an expected and necessary part of uninstallation. so I tried to re-install just the 64-bit version; then I got an error message that AutoHotkey.exe was in use and could not continue, even though I had no instances of it running. The error message comes from the system, based on A_LastError set by FileCopy. If it says the file was in use, the file was in use. I'd be interested to learn what by. Maybe you could use Process Explorer or something similar to find out. I suppose it wasn't a script, because the installer is supposed to detect scripts and close them for you (after confirmation). I explained this in my first post. FYI, both AutoHotkey installers merely write or delete the DefaultIcon value in the registry. Windows handles the rest, apparently not very well. I did not need to do such things. Lucky you. I tried what you suggested and more. I had noticed that, and decided it wasn't worth fixing. Currently it only occurs when you run AutoHotkey_L Setup after installation, because it adds the Ahk2Exe note in bold. Wow, I had not seen the new installer (the check-for-updates script handled it), but it is very nice! Specifically: The system cannot find the path specified.